FABIAN, a layman who happened to be in Rome, and in the crowd of onlookers, on the day a successor to Pope St. Anterus was being selected. St. Fabian was chosen to be the twentieth Pope of Rome by acclimation when a dove alighted upon his head and the assembled clergy and laity took this as a sign from the Holy Spirit. St. Fabian served the See of Rome from his selection in 236 until his martyrdom in 250. St. Fabian has been credited with sending St. Denis of Paris (9th October) to Gaul, and with being the first martyr of the Decian Persecution. FECHIN, a native of Co. Sligo in Connaught and the founder of several monasteries in that region; St. Fechin is principally remembered for founding the monastery at Fore (Fobar), Co. Westmeath. Ecclefechan and St. Vigean’s near Arbroath in Scotland also perpetuate his memory. He is said to have lived a life of extraordinary penance, spending his nights reciting the entire Psalter. St. Fechin reposed circa 665. MAURUS, a nephew of Pope John IX, St. Maurus was priested and then received monastic tonsure at Classe in Ravenna, where in 926 he was elected Abbot. In 934, St. Maurus was consecrated Bishop of Cesena. As Bishop, St. Maurus had built a small cell on Spaziano Hill in which his relics were buried upon his repose in 946. Around sixty-five years later construction was commenced on the Abbey of Santa Maria del Monte at the location of St. Maurus’ cell. 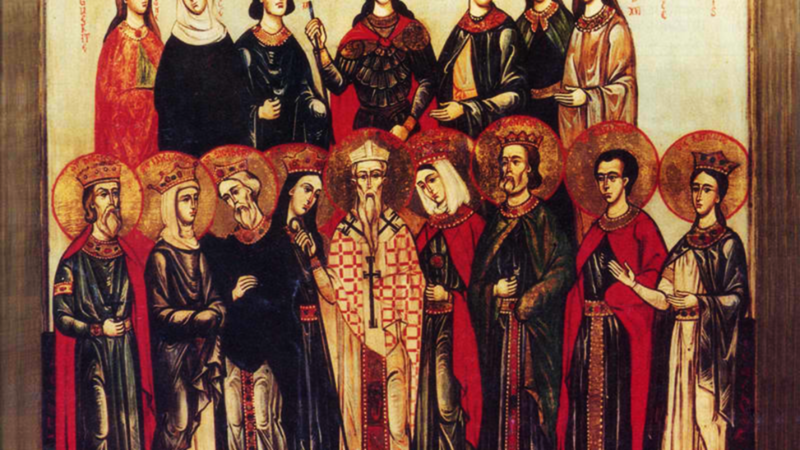 MOLAGGA (LAICIN), though there are several Saints of the same name (most Irish hagiographers count at least twelve), and it is often difficult to disentangle their Lives, it is believed this St. Molagga was a disciple of St. David of Wales (1st March). Returning to his native Ireland, he founded a monastery at what is now Fermoy (Irish: Mainistir Fhear Maí, meaning “monastery of the Men of the Plain”) Co. Cork. He was distinguished for his exceptional learning and piety as well as his Christian charity. St. Molagga seems to have survived the Great Pestilence of 664, reposing circa 655, and is greatly venerated in the South of Ireland. SEBASTIAN, an officer in the imperial army, captain of the Praetorian guard, a favourite of the Emperor Diocletian (r. 284–304), and a secret Christian. During the Diocletianic Persecution, St. Sebastian visited imprisoned Christians, and is reputed to have converted soldiers, a governor, and healed the wife of a fellow guard by making the sign of the Cross over her. Soon his identity as a Christian was no longer secret, and his status and favour with Diocletian proved no help. 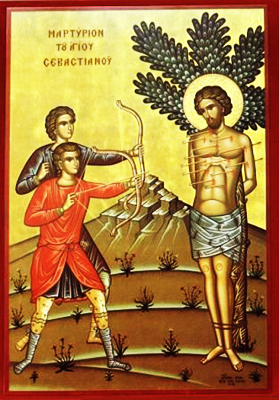 St. Sebastian was arrested, tied to a tree, and shot full of arrows by soldiers who used him for target practice. He miraculously survived, but was ordered beaten to death by Diocletian, circa 288.